How to crochet summer top. Size 36/38 (42/44) – US size 10/12 (16/18). 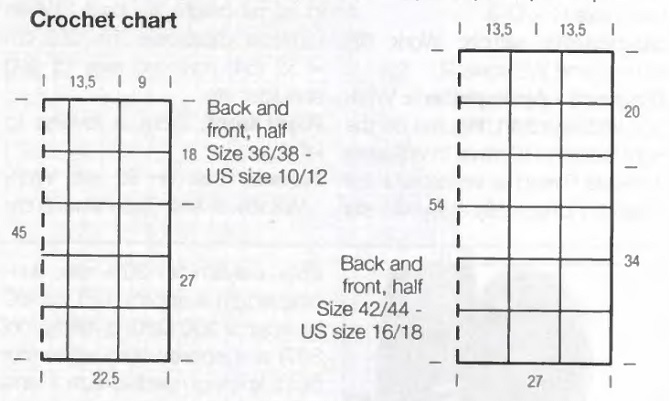 Figures in brackets () refer to sizes 42/44 (US size 16/18). Where only one figure is given, this refers to all sizes. 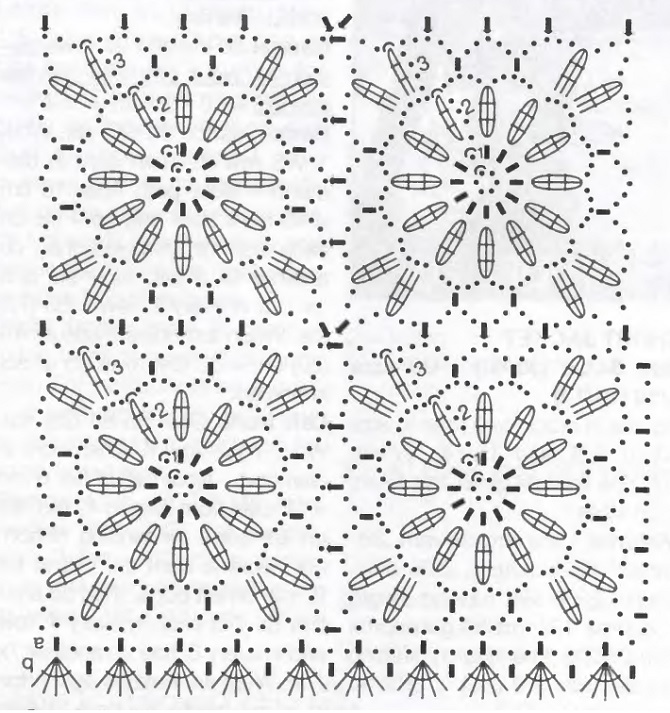 Square flower motif: Work in rnds acc crochet chart. Start with a cast on of 6 chain sts, join into a ring with 1 knit st. Then crochet 3 rnds as indicated. Figures indicate rnds. Join each rnd into a ring with 1 knit st. Work each group of sc and tr in 3. rnd across loops of chain sts of prev rnd. Back: Crochet 25(36) motifs all in all. To do so work 1. row of motifs with 5(6) squares. From 2. motif onwards crochet squares tog immediately, thereby always substitute center chain st by 1 sc in 3. rnd and crochet sc across loop of chain sts of foll square as indicated. Rep the same in 2. row of motif but crochet on 2. – 5. motif across 2 sides of squares. At those places where 4 motifs meet, work sc into sc which has been worked already as indicated in crochet chart. After 5. (6.) motif row piece is completed. Now crochet 1 rnd of a acc crochet chart across whole edge of back piece to even out edges. To do so cast on 1 knit st just before 1 corner motif and substitute 1. sc by 1 chain st. Join rnd into a ring with 1 knit st.
Finishing: Block pieces acc to measurements, dampen and allow to dry. Join shoulder seams across 9 (13.5) cm each, join side seams across 27 (34) cm each. Crochet 1 rnd of crab sts = sc worked from left to right across edge of neckline. Crochet 1 rnd of sell sts = rnd b acc crochet chart, across lower edge of top. To do so cast on 1 knit st across 1 side seam and substitute 1. sc by 1 chain st. Join rnd with 1 knit st. Crochet 1 rnd of sell sts across edges of armholes as well. This entry was posted in Crochet, DIY and tagged crochet, free, pattern, summer, top. 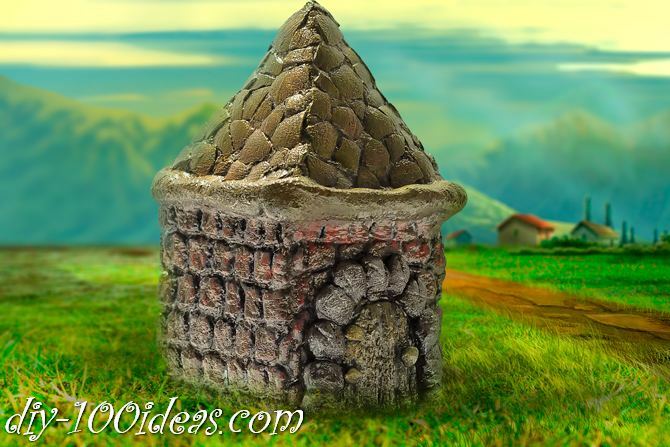 How to make miniature house out of salt dough.